Born July 18th 1918, Nelson Mandela is arguably one of the greatest statesman of the 20th century. He has dedicated his life fighting for the freedom of South Africa and the South African people. He was incarcerated for 17 years on Robben Island - off the coast of Cape Town, South Africa. 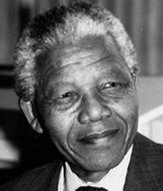 Mandela’s achievements and his personal triumph have become a powerful symbol to people all over the world that good will ultimately prevail over evil.